Come share an evening together, with friends, alumni and family while supporting the Queen's Football Club. Tickets are available for $250 per person. Proceeds from the football dinner will help the Football Club provide student-athletes with athletic financial support, academic support services, performance health and wellness support, and elite training opportunities. If you can't attend, consider donating to the Football Club. Your donation will go directly to help enhance opportunities available to football student-athletes. We are looking for event sponsors. To find out more information contact Danielle Gattinger via email. We are also looking for silent auction items. Please contact Dave Shaw via email if you or your company has item(s) to donate. Fairmont Luxury Rooms are available for $279 +tax per night. 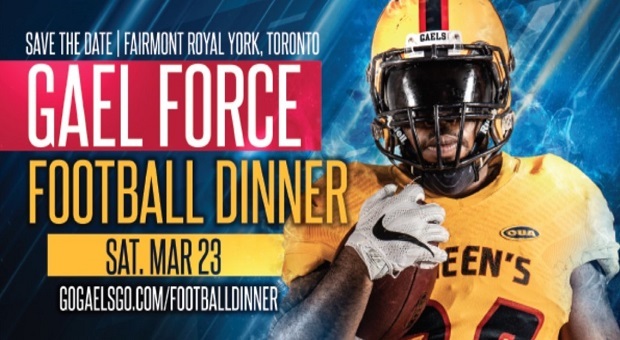 To book your room at the special event rate, contact the Fairmont Royal York at 1-800-257-7544 and reference the Queen's 2019 Gael Force Football Dinner, or use the block code QUEE0219. Cocktail hour begins at 6:00 PM, evening proceedings begin at 7:00 PM.